Only a crude coconut fiber processing facility for export lawsuits can also earn several billion dong each year. Khanh Thanh Tan is a famous village of processing coconut products for export in Ben Tre province with nearly 40 facilities and businesses. This village is located along the Co Chien river, belonging to H.Moc Cay Bac. Thanks to the location on the dock under the boat convenient for waterway traffic, this village has developed strongly for many years. 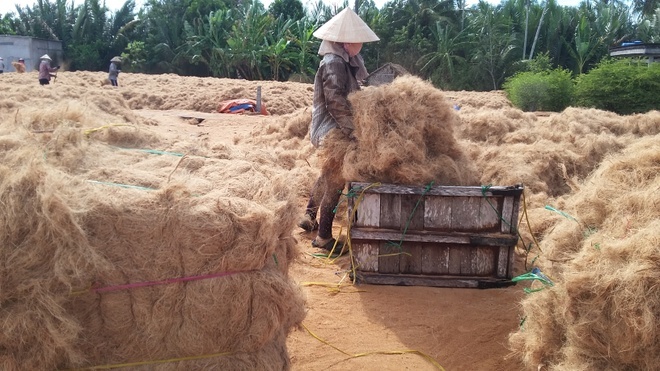 On a land area of ​​about 3,000 m2, under the dazzling sunshine of the afternoon, dozens of workers of Nguyen Ngoc Can Co., Ltd still diligently come back and back to each bed of coir being exposed to prepare to export. password A worker here said that on good sunny days, the amount of coconut fiber exposed was high, the wages could be up to VND 300,000 / day, less than VND 200,000. Mr. Tran Ngoc Tu, a representative of this enterprise, said: The establishment only exported raw coconut bales, each year several tens of thousands of tons with the current price of 170 USD / ton. At peak prices up to 320 USD / ton. But now due to slow Chinese purchasing, the price decreases. Thus, each year this facility also collected a few billion VND from the export of raw coconut fiber only. Currently the establishment creates jobs for about 20 employees. Mr. Tu also said, if this coir fiber is turned into yarn, the export price will be over 500 USD / ton. If woven into coconut fiber carpet, the price is much higher and not fixed because it depends on the model, the size of the importer. People use only raw coconut fiber to process construction materials, agricultural materials and many other things, only thread used to make handicrafts.